The thing about travelling so much is that almost everywhere you go reminds you of somewhere you’ve been before. And while I really do enjoy the places that remind me of nowhere else I’ve ever been, I also get a kick out of places that make me reminisce. While many places in Mali remind me of nowhere else I’d seen before, whenever I look out onto the Niger River I think about Egypt. Sure, the Niger isn’t as big as the Nile, nor is it filled with faluccas, but it rolls with the same patience grace as Nile does. Moreover, like in Egypt, the river provides life to the sandy land that it snakes through. Everywhere along the Niger River there is life and activity. This great river flows from Guinea before twisting and turning its way through Central Africa providing life to otherwise desolate landscapes. This is a photo I took in the town of Segou, Mali last week. Photography in the desert can be a bit of a challenge. You’re almost always stuck with really bland looking blue skies that don’t add any depth to your images. The other big issue is that there is always a lot of dust and sediment hanging in the air which further adds to the dullness of shots. Aside from sunrise and sunset, deserts aren’t a whole lot of fun to photograph. However, as they say “if you can’t beat them join them.” Basically, in creating this image I used the terrible photography elements to create something that offered that mood of dull and desolate. 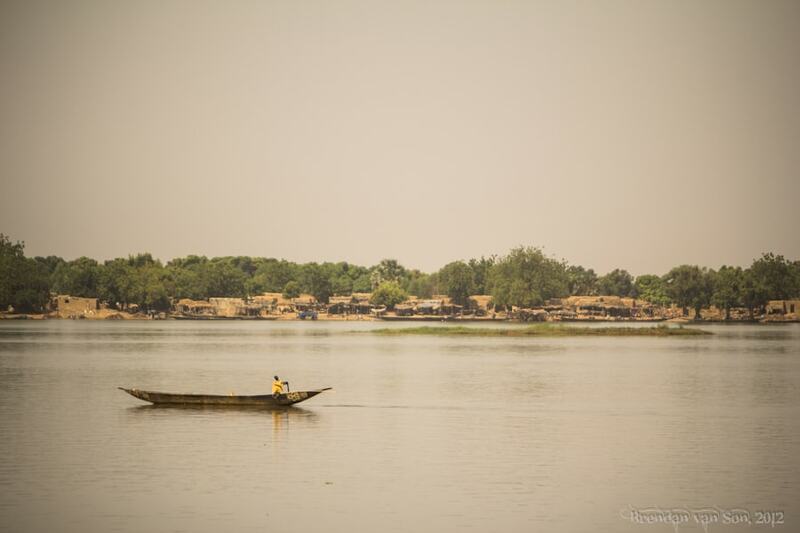 In the end, it really works with this image of the pirogue on the Niger River. It has a bit of a minimalist feel to it which is something I rarely do. However, I think it works and hope you like it as well. I like it.. the colors are subtle yet effective.The sky and the water are almost identical. It has the feel of a 1970’s Polaroid shot.